Two, I seem to have a different mind set to when I'm decorating my house to when I'm creating in the shop. My house is a mix of modern and cosy comforts, which I will be sharing with you in the 'Interiors' posts on my blog. My style is a mix of country wood and industrial metals, which sounds odd but I hope I can show you more about this as we go along in future posts. 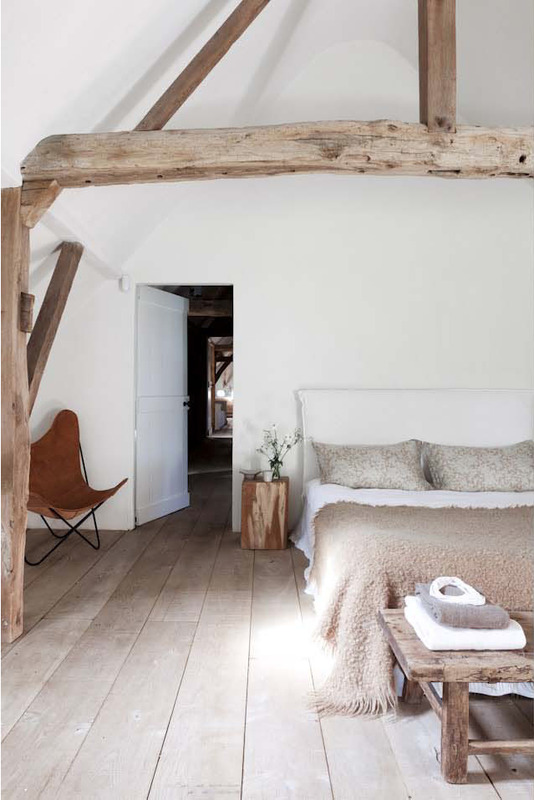 This first picture is a dream to me, high ceilings, a mix of modern white and cosy country wood. Tonal colours and a really rustic look. The beams and flooring in this room are exactly what I'd want in a country bedroom. The white paint gives it space and light which you'd need with all the woody colours. This next picture is a real luxury looking room. With that amazing fireplace in the centre of the room. Again woody beams, white walls, but this time with more classic furniture and shabby chic details. I love the brick wall in this bedroom, and love the vintage furniture and details! The hint of white around the top of this wall makes it not seem so heavy, and the chandelier is just a huge feature to the room! This could work with old brick wallpaper, just make sure its not to much of a repeat pattern, odd and misshaped bricks looks way more high end! Dorset Cushions are great additions to any country style home, It's obviously more apt if you live in Dorset, but in a spot print fabric like this- they look great on the bed! You can't have a country theme without some wildlife, and the Pheasant is a great example. A Pheasant silhouette cushion would look great in a really tonal country bedroom, especially in this grey spot fabric. Thank you for reading and I hope you find loads of inspiring ideas for your bedrooms!